Central Utah Water Conservancy District » Check us out! OK, we probably haven’t drummed up the same anticipation as, say, the latest “Star Wars” movie or a trip to Disney World with the release of our Consumer Confidence Report 2015. But with water issues such as lead contamination in Flint, Mich., grabbing headlines lately, the idea of consumer confidence takes on more meaning this year. 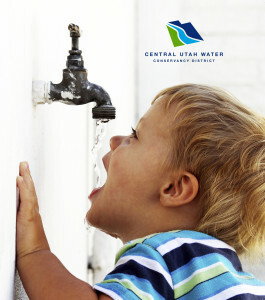 To find your supplier, go to cuwcd.com and hover your mouse over the link titled “Drinking Water” for a list of the district’s water treatment plants: Duchesne Valley, Utah Valley and Ashley Valley. Each has its own report, following the flow of water from its natural sources through the filtering and treatment processes to your kitchen sink. You’ll learn about watersheds and reservoirs, and the differences between surface and ground water, along with some random trivia. Be sure to review the final pages of these data-driven reports, which break down what is found, filtered out and allowed in moderation in your drinking water. Lead? It’s not even on our list, Gerard Yates says. When you know how to read the rest of the water data, you’ll see there’s good reason to feel confident in our nationally recognized water supply. “We value our water quality,” Yates says, pointing out the E. coli rank has tested clear for as long as he can remember. Mineral elements such as iron, calcium and sulfate naturally occur as the water works through the earth’s surface. Others, such as chlorine, are remnants of chemicals added in the treatment process. After all, Yates points out, treatment plant crews achieve in one or two hours what nature does in 1,000 years as water filters through the ground.